The Brookville Reformed Church, the fourth church to be erected on this site built in 1924. From the Village of Brookville's website: "In 1732, the Dutch bought the property at the intersection of what we know as Wheatley Road and Brookville Road to establish a church. There were many springs and a brook on the property, and it is said that the wolves gathered there to drink. Thus, the Dutch called Wolver Hollow. 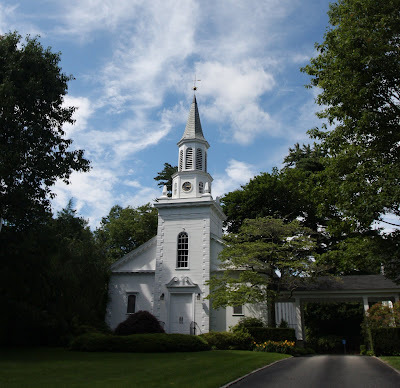 The church, which was built at that time, was known as the Reformed Dutch Church of Oyster Bay. Four different structures have been built over the years and the present stately and beautiful building was dedicated in 1924. It was renamed the Brookville Reformed Church and still stands on the original site."